We read in Genesis that creation came into being with the first utterance: “Let there be light.” So sound came first, then light, followed by forms. Interestingly, the seemingly nonsensical phrase, abracadabra, a magician says when performing a trick, derives its meaning from the ancient biblical language, Aramaic: abraq ad habra, which means, “I will create as I speak.” I discovered that on page 170 of Poemcrazy: Freeing Your Life with Words, a delightful book on finding and writing poetry in many creative simple ways, by Susan Wooldridge, writer, poet and teacher. This poem by Kukai says a lot about language, creation, consciousness, and our integral relationship to things. 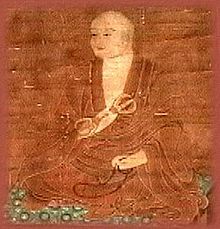 This poem on language, translation, and creation, the pictorial/written representation of vocal sounds and meanings, was written by Kūkai (空海), also known posthumously as Kōbō-Daishi (弘法大師 The Grand Master Who Propagated the Buddhist Teaching), 774–835, a Japanese monk, civil servant, scholar, poet, artist, and founder of the Shingon or “True Word” school of Buddhism. He allegedly developed the system using Chinese characters to write Japanese words. The word “Shingon” is the Japanese reading of the Kanji for the Chinese word Zhēnyán (真言), literally meaning “True Words”, which in turn is the Chinese translation of the Sanskrit word mantra (मन्त्र). The concern was to be as true as possible when translating texts, to have and use the right word when describing something. The Sanskrit language had this perfect one-to-one correspondence between name and form. The poem was mentioned in Nine Gates: Entering the Mind of Poetry (HarperCollins, 1997) by Jane Hirshfield, a classic collection of essays about the mysterious ways poetry comes to us. In her chapter, The World is Large and Full of Noises: Thoughts on Translation, she highlights this theme with What Rainer Maria Rilke inscribed on the copy of The Duino Elegies he gave his Polish translator. When I read that line in Kukai’s poem, about the first word, “Ah,” blossoming into all others, and each of them being true, it reminded me of what Maharishi Mahesh Yogi says about the first sound of creation, “A”, how it represents infinity collapsing to a point, “K”, and through its own sequential self-interacting dynamics, creates the whole alphabet, words, verses of Rk Veda, the whole Vedic literature, and their subsequent forms, the universe. This is part of Maharishi’s Apaurusheya Bahashya, the unwritten commentary of the Veda, unfolding itself and commenting on itself to itself. Apaurusheya Bhashya: Rk Veda is said to be nitya, eternal, and apaurusheya, uncreated. Maharishi explains that the sequential unfoldment of Rk Veda is its own uncreated, or unmanifest, commentary on itself, rather than that of an individual making an ‘external’ commentary on Rk Veda. See Veda and the Unified Field of Natural Law and scroll down to find Maharishi’s Apaurusheya Bhashya. In his Introduction to Maharishi Vedic University, Maharishi gives us a comprehensive cosmic perspective on the role Sanskrit, the language of Nature, plays in the process of creation. Through the self-interacting dynamics of pure consciousness, the Self, or Atma, reverberates within itself and creates the eternal uncreated sounds of the Veda, its own language, which in turn express themselves into forms—the individual body, Sharir, and the cosmic body, Vishwa. The eternal Silence and its own inherent Dynamism, evolve all parts of itself constantly referring them back to their source. He says it’s a start-stop process of Infinity collapsing to a point, referring it back to Itself, and evolving the next sound, and subsequent form. Full realization, or enlightenment, comes when one comprehends all of creation: Atma, Veda, Sharir, Vishwa, Brahman, or Totality, as the full potential of one’s own consciousness. Aham Brahmasmi. I am totality. On Page 65 Maharishi writes, “The basic process of change, this basic process of transformation, continuously maintains the momentum of evolution of different levels of expression, creating different levels of manifestation upholding the process of evolution. I’ve written a poem about this process in Coalescing Poetry: Creating a Universe, (into haiku forms). 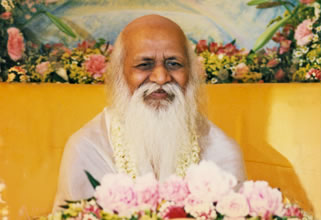 To learn more about the source of words, creation, both literal and literary, and their connection to consciousness, read: The Flow of Consciousness: Maharishi Mahesh Yogi on Literature and Language. Also see: Before He Makes Each One by Rainer Maria Rilke. This entry was posted on January 2, 2012 at 11:01 pm and is filed under Other poems, Poetry, Writing. You can follow any responses to this entry through the RSS 2.0 feed. You can leave a response, or trackback from your own site.